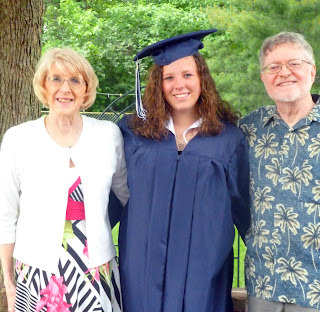 Over the weekend, we went to my Granddaughter’s High School graduation, and had a wonderful time It’s hard to believe that she is old enough to be graduating from high school, and going on to college. Where did those years go? So many memories of this little girl having tea parties, baking cookies, and playing basketball and running track. She changed into a beautiful young woman, right before my eyes. The weather was great, saw lots of people, and ate lots of good food. I knew that she was having a big cake, but I wanted to make cupcakes for her, too. I found these cute Smiley face cupcake liners, and cupcake toppers, perfect! She's a smiley face type of girl! She wanted lemon cupcakes, with Vanilla Butter Cream Frosting. No problem. I baked the cupcakes Thursday and frosted them when I got there, for easier transport. They were a hit. When I took the cupcakes out of the oven, I tasted one to check the lemon flavor, and I wanted more of a lemon taste. So, I made a lemon glaze of lemon juice, sugar, and a pat of butter. and then dipped the warm cupcakes into the glaze. Now we got a lot of lemon flavor, yum! I had to take a picture of her cake. Not your typical graduation cake! It was made by two girls working their way through college by making cakes. 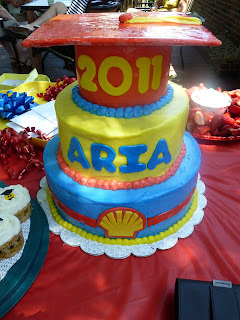 Aria designed her own cake.. The Shell logo is their High School Team name. There is a Shell refinery in their town, hence the team name. 1. Preheat the oven to 325°F. Insert liners into a medium cupcake pan. 2. In a large bowl cream together the butter and sugar with an electric mixer on medium speed until fluffy, 3-5 minutes. Add the eggs one at a time to creamed mixture, beating 1 minute after each addition. 3. In a separate bowl combine the flour, baking soda, and salt. 4. Add the dry ingredients to the creamed mixture, alternating with the milk. Mix until completely integrated. Add the lemon zest, lemon juice. . Mix the batter for 30 seconds. 5. Fill the cupcake liners three-quarters full. Bake for about 20 minutes or until a toothpick comes out clean. Bring ingredients to boil over med. heat. Spoon over warm cupcakes. Frost cupcakes when completely cooled. Oh congrats to Aria!! What a pretty name too! Sweet cupcakes for a sweet graduation party. Thank you for sharing this with your followers and the FoodBuzz community. Cupcakes look and sound wonderful. Love it Becky, Congrats to Aria on her achievement. That was a special touch I'm sure she will remember. Congratulations to Aria!! You have a gorgeous granddaughter! Congrats to Aria! The cupcakes look so cute and sound absolutely amazing! And what a beautiful cake too! That's so cool that she designed it and that it was made by college girls. You have a beautiful granddaughter, Becky, and the cupcakes are adorable! This is Carolyn from All Day I Dream About Food, by the way. Having trouble logging into Blogger lately. Raven- If you love lemon, you'll love these cupcakes! An Alaskan Cooks- thanks for stopping by. 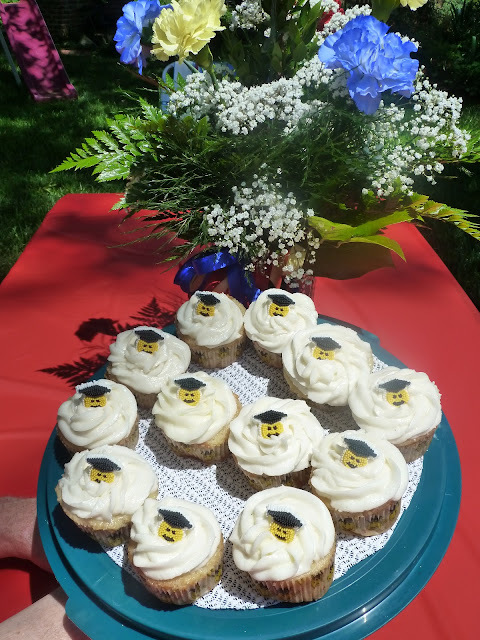 It was a wonderful graduation party for a sweet girl! Christine and Gina- thank you for your kind words! Carolyn- Thank you for your comments. I hear you about blogger. Chris-Thank you for your kind words! Brandie- thanks for being the guest blogger, and your comments! Jill- I was impressed by the design of the cake, as well. You have a beautiful granddaughter, Becky! Great job with those cupcakes! I wish I could pipe like that! Kate- Thanks for the comments. I'm still a novice, when it comes to piping. It takes a lot of practice! You could do it! Becky-Congratulations to Aria on her graduation! The cupcakes did turn out so great...love the butter cream swirl decoration with the adorable little smileys. Also the beautiful bouquet of flowers, and the special cake her friends made. Congratulations to your beautiful granddaughter...your cupcakes look wonderful!